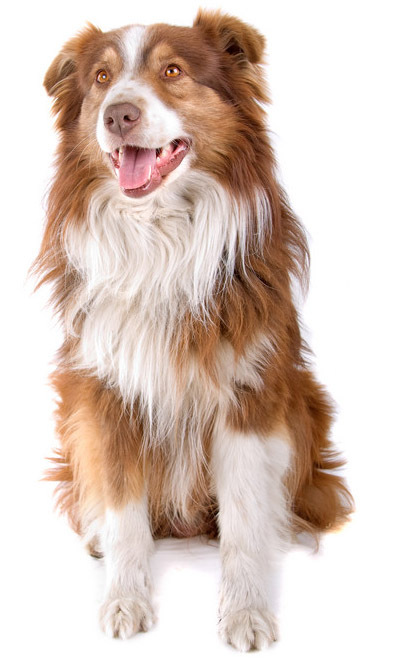 Learn about the temperament and personality of the Australian Shepherd. Discover what he's like to live with, his traits and characteristics and how he generally behaves. And look at lots of Australian Shepherd photos. The Australian Shepherd, lovingly called an "Aussie," is a highly intelligent, incredibly energetic, people-loving dog who needs to have a job to do. They need lots and lots of exercise and will fit in well with an active person or family. They are bred to herd, and might try to herd anything, including you, your children, your neighbor's child on a bicycle, innocent strangers jogging past your house, ducks, squirrels, cats, and cars. You will need a fence to keep them off the road. They also have strong guarding instincts, and want to be near their family at all times. Originally bred as all-purpose farm dogs, Aussies were left to supervise the children while the parents worked in the fields. They are good with children, except for the occasional nipping at their heels to herd them into position. They will follow you from room to room and supervise you in the bathroom. They are very affectionate and will want to lick your face. They are assertive by nature, highly territorial and can be pushy. They are very protective of their family and home, and are cautious around strangers. They need lots of mental stimulation and physical exercise, or problem behaviors will arise. They are the opposite of the couch potato dog. They need to have a sense of purpose, which is why so many of them excel in obedience and agility competitions. They are highly trainable, versatile, and are quick learners. They usually love to play ball and Frisbee, and many of them enjoy swimming. If you are in the market for a full-time center of attention family pet, full of exuberance and demanding of your attention, then an Aussie might be for you. They are good-natured, eager to please, and remarkably loyal. But they will need to be at the top of your priority list. The Australian Shepherd is a very heavy shedder. He sheds an awful lot of hair! You'll find hair all over your home, stuck to everything! You'll probably even find it in the butter!